Defending apps in the cloud can be difficult – especially if you are pursuing a multi-cloud strategy. No matter where you deploy, your apps need resilience, which means robust defenses to ensure their continued availability. 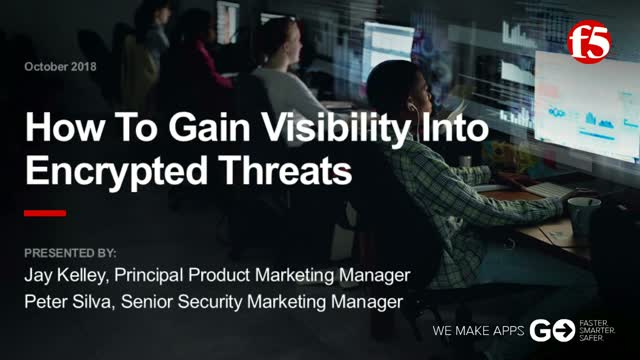 Ensure your customers (and their data) get the protection they need in the face of current and emergent threats. Not all risks are related to software vulnerabilities - some, such as “credential stuffing”, are inherited from breaches that have occurred elsewhere. Portable, proactive security is possible. Make sure your development teams have access to the tools they need to enable them to move fast while still delivering the confidentiality, integrity, and availability your customers expect and deserve. There are lots of options; be sure to leverage the ones best suited to protect your technology platforms and business priorities. DDoS attacks continue to increase in frequency – and complexity. Your network, apps, and other supporting infrastructure make for a large DDoS attack surface, meaning defense must be comprehensive. A DDoS solution should address all types of attacks whether a volumetric attack aimed at your network bandwidth or a low-and-slow attack aimed at your app or infrastructure. F5 DDoS Hybrid Defender (DHD) is a unique solution that offers comprehensive DDoS protection against all attack types, turning a potential catastrophe into a minor annoyance. Our modern world depends on healthy, functioning, IoT devices; however, many of them are unsecure. Cyber attackers have compromised IoT devices for over a decade, turning them into Thingbots―botnets made from IoT devices. The hunt for IoT attacks has made a pivotal turn in the last two and a half years. F5 Labs has been tracking these attacks and the subsequent building of Thingbots from boutique attacks, into more sophisticated and powerful cyber weapons. Thingbots are now being sold as multi-vector bots-for-hire that allow cyber attackers to launch any attack of their choice―often used for automated web application attacks and credential stuffing. With the threat of IoT attacks increasing, as billions of new devices are deployed each year, the ability to detect threats, and clean and upgrade infected systems is still not a part of most IoT development processes. While attackers have been exploiting IoT devices in the consumer market for a while, they’re now increasingly targeting higher value business targets. IoT devices are typically not secure and they can be used to gain entry into your network where a devastating attack can then be carried out. Hear experts from F5 and Microsoft talk about joint offerings that provide more secure application delivery, upgrade federated identity security, and maximize app security in the cloud. Web application attacks are the #1 source of data breaches. A Web Application Firewall (WAF) provides critical security controls to protect web apps. However, not all WAF solutions are the same. While many can help an organization protect their apps from common and known threats, most are inadequate against the myriad of attacks across the evolving risk landscape. Security in the cloud vs. cloud security – whose job is it anyway? According to F5 Labs researchers, 86% of successful data breaches begin with compromises of the application layer services or user identities – placing responsibility for app security squarely in the hands of the app owners, developers, and enterprises deploying them. Application security can be difficult and daunting, but it doesn’t have to be. The cloud paradigm has made infrastructure easy for lots of us, and application security is poised to follow suit with advanced security tools now more affordable and accessible than ever via your favorite cloud du jour. We’ve reached a new inflection point where security tools once seen as costly and burdensome can now be seen as business enablers. Bots are now teetering on the edge of being the majority of traffic on the internet. It’s not all bad news, as there are plenty of useful bots that make both our work and personal lives more productive. However, malicious bot and botnet creators have introduced more sophistication into their bots, making them harder to detect, and the resulting threats are becoming more common place. Join F5 and (ISC)2 on March 29, 2018 at 1:00PM Eastern as data gathered from internal threat research teams is presented that explains how bots are being created, the top application threats driven by bots, and how to detect and better protect to your business. In today’s digital marketplace, your applications are the backbone of your business. However, cloud-based apps create a host of complex challenges and new risks. With automated tools and hackers for hire, threats are increasing and cybercrime has turned into a game for profit. The digital world has opened the door to unprecedented threats, putting your corporate data and reputation at risk. Our modern world depends on healthy, functioning, IoT devices. Unfortunately many of them are terribly insecure. Cyber attackers know this and have been aggressively compromising IoT devices for years. For the past two years, F5 Labs has been tracking cyber attackers as they hunt, infect, and build “Thingbots” - botnets made from IoT devices. This hunt has developed sizable thingbots like the infamous Mirai, and many others that have the capability to launch globally destructive attacks. These attacks can significantly impact modern life because of IoT’s presence within power systems, transportation systems, airport monitors, emergency warning systems, and security cameras. Join F5 and (ISC)2 on March 1, 2018 at 1:00PM Eastern for the 2nd Part of our three part Security Briefings series where we’ll explore the threat actors behind these attacks, the geographical targets of their attacks, how they are evolving their attack methods, and the types of devices impacted. We’ll include tips on how to start protecting yourself personally, and what you should be doing to protect your businesses. Chances are, your organization has made a move to the cloud. In fact, most enterprises run approx. 45% of their applications and infrastructure in the cloud with that number sure to increase in the next 12 months. But as you relocate more into the cloud, what’s your strategy? What are you moving? What benefit are you seeking? Different businesses have different goals and objectives. Join F5 and (ISC)2 on February 15, 2018 at 1:00PM Eastern for a discussion on the continuing evolution of cloud migration and how organizations should prepare, strategize and execute their cloud journey while addressing operational needs, security concerns and the options that cloud-based services can bring. Web application security is complex, difficult, and costly. These issues are well known, but remain prevalent out in the real world. Most development teams do not have the time or resources to sufficiently protect against the myriad of attacks that are relevant to each vector, while the level of expertise required to address these issues are difficult to come by even if your project has the time and budget for it. The good news is that advanced WAF technology is more accessible and affordable than ever before. With the right tools, comprehensive WAF coverage can not only reduce your exposures and give you better control over your applications but also help optimize your resources and reduce overall operating costs. Join F5 and (ISC)2 for Part 1 of a 3 part Security Briefings Series on February 1, 2018 at 1PM Eastern where we’ll discuss the OWASP Top 10, defenses for everything it addresses and how to use WAF to optimize and filter unwanted traffic to cut costs in the cloud. Cloud-delivered services are the foundation of the enterprise digital transformation. While the business benefits are compelling, balancing security with user experience can still impose challenging obstacles to innovation. Enterprises modernizing to the cloud must find solutions that complement and extend existing on-prem investments as they transition to “cloud first” architectures. John Wagnon walks through the process of the TLS handshake between client and server (BIG-IP). The essence of the Credential Stuffing problem centers around the fact that lots and lots of user credentials have been stolen from many different places. An attacker will take stolen credentials from one place and try to "stuff" them into another in order to gain access. The problem (other than the fact that credentials were stolen) is that many people use the same username and password for multiple web applications. This video discusses the issue of credential stuffing and offers solutions to avoid this problem. F5 provides a comprehensive, integrated security suite for protecting against primary risks associated with your apps—no matter where they reside—helping ensure the confidentiality, integrity, and availability of your applications and data. Backed by threat intelligence and security experts, you can better navigate today’s ever-changing threat landscape.